The “ultra-luxury country club” of Tseleevo Golf & Polo Club offers invited members access to a 1,000-acre sports facility that includes a private ski slope, polo club, hunting club, luxury spa and – for those with any energy left – a wonderful 18-hole golf course. Carved out of mature woodland, the 7,491-yard layout lies on the northern outskirts of Moscow and it became Russia’s first Nicklaus Design course when it opened in 2008. At the time, the Golden Bear called it one of the top ten courses that he’d built so far and it received widespread praise two years later when it hosted the Russian Challenge Cup on the European Challenge Tour, an event won by Carlos Del Moral. The signature hole is the 455-yard par four 7th, where a blind tee shot is played to a downhill fairway that doglegs to the left. The green is well guarded by water to the front with bunkers on either side but – apart from the professionals during tournament play – who really cares what score you run up on such a visually stunning hole? In July 2013, the European Tour returned to Russia after a five-year gap. Moscow Country Club last hosted the Russian Open in 2008, but the re-branded and re-kindled Russian Open moved north of the capital to the exclusive Tseleevo Golf & Polo Club. Michael Hoey lifted the 2013 title, winning emphatically by four shots to become the first player from Northern Ireland to win the Russian Open. 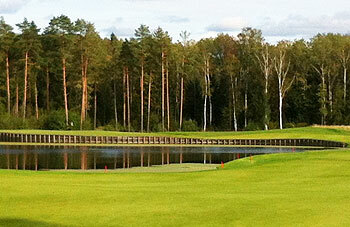 I played Tseleevo Golf & Polo Club in September 2012. I was on holidays and made my way there in a hire car, which was a bit expensive. The cheapest way to get there is to catch the train to Dedenevo and then a short cab ride. Will save you heaps. The course is open to visitors, however, it will cost in excess of $200US with green fees and club hire. My recommendation is to do it. The course is absolutely magnificent. Very challenging but is an experience I will never forget. The 10th is an unforgettable down hill hole and then you play their version of Amen Corner, I highly recommend the course if you ever get a chance to play. Unless you are an expert remember to take some extra balls.